Today's gorgeous wedding inspiration shoot from from Mary Claire Photography, is filled unique styling ideas and plenty of color! And with creative styling by Amber Reverie, it's easy to see that these talented ladies took the idea of using color to a whole new and exiting level! From the Designer, "for the concept of this shoot, we were inspired by the multi-toned depth and fluidity of ink, along with the opulent yet rugged nature of ice. I couldn't get these inky blues out of my mind. I love how they're a little moody and haunting, while still fresh. We were able to play with a lot of juxtaposition in this shoot. Light with dark. Translucent with opaque. Still life with movement." "The whole design was created to look collected and layered. We had a simple cake with sugared blueberries that looked almost like they were frosted over. Stacked books, candles, layered fur rugs, heirloom pieces and some lovely florals were simple details that made the space feel inviting and warm, despite a cool palette." "Instead of full blooms like garden roses or peonies that have been so prevalent in weddings, I opted for a more light-handed approach. I played with texture and shades of blues with bold thistle and soft ginestra. My foliage also veered more in the direction of blueish greens, like seeded eucalyptus, blue spruce, even kale. To lighten things up a bit, I brought in delicate queen anne's lace, plumosa fern, bowing white tulips, and the sweetest little Italian ranunculus. It was so exhilarating splatter painting the linen with blots of ink blue. I probably looked like a crazy person to the people driving by, going all Jackson Pollock in my front yard. But it was a fun project that allowed me to forget precision and let the paint to do its thing. This would be an easy and impactful DIY for any bride or groom to duplicate. We pulled together fashions based on our inspiration. Each look incorporated sparkling beadwork, along with amazing raw crystal jewelry to play off both the elegant and coarse sides of ice. We made that tulle skirt with layers of blue and grey to reflect the almost iridescence of ink. All of the girls were styled with full-length skirts, dark glam makeup and tousled hair. I absolutely love the effortlessly luxe vibe our talented stylists achieved. These looks could easily be done as non-traditional wedding attire, or for a glammed up shower or party with the girls." 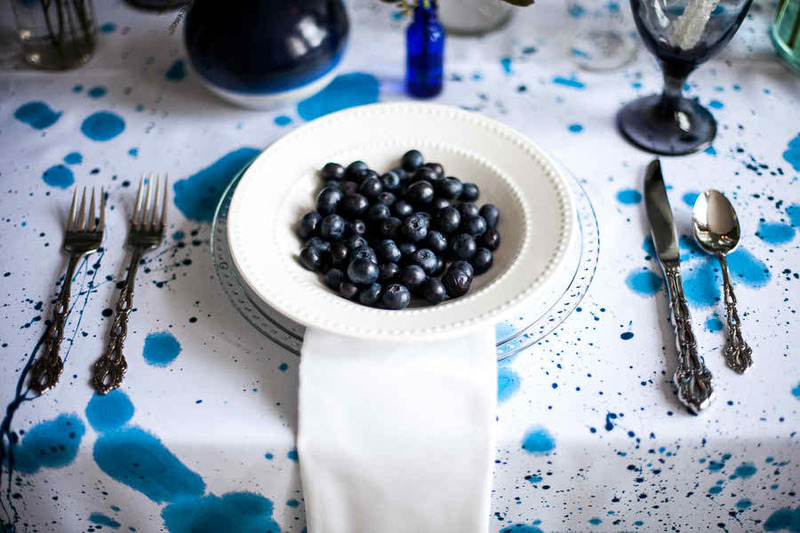 10 Comments " A Modern Mix of Blues | Color Palettes for Weddings "
So modern and creative! I just love the idea of doing paint splatter linens - that would be soooo much fun for a couple to do or the bride with her bridesmaids during a craft party! Nice concepts here. Feels like a dream. Love the colors, the cake, and who wouldn't want that glittering skirt?! So much to love here! I love the range of blues, the tulle and sequins, and those blue thistle arrangements! Great shoot! Officially obsessed with everything going on here. So stylish! Hello guys do you know that going through a review of websites will give you much insight about it which you can’t know by simply visiting it,Here is the Assignment help Reviews that reviews the website and provides you the best website . Awesome and useful blog post on fashion.